does it all HAVE to mean something? i’m pretty sure i have posted about this before…in the past…i don’t know. but here it is, stumbling back into my brain like a drunk cousin that calls you for a place to sleep while they are “in town”. it is odd, the feeling i get when i see kid art. 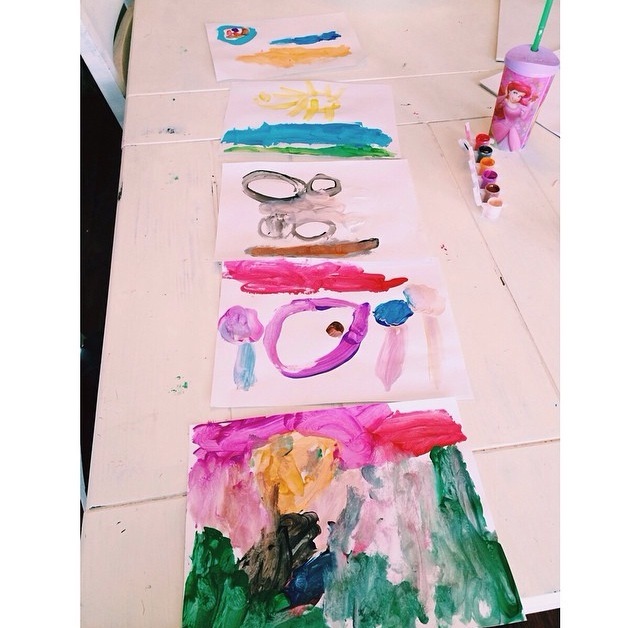 something about kids painting pictures of their moms, their houses, their dogs, their unicorns…wait, what….their DREAMS…it always hits this innocent spot within me. it makes me remember the days i sat around and dreamed for no other reason other than to just dream. it felt good to believe the impossible, and seek out the unlikely. and when i see kid art, it reminds me that at some point in my life, i did things “just because”. i had absolutely no productive reason to do any of it, but i did it none the less. and it made me happy, even though there was no sellable product or result to come from it other than my mom telling me “good job” and my sister laughing at my polka-dotted horse that reminded her of something that had been shot…a bunch. linds, it was POLKA-DOTS! that horse was beyond happy with its spots. my husband is a big dreamer. he stops short when you ask him to do it out loud and on purpose, but that doesn’t matter. he LIVES it. i see him teach himself new tricks all the time — embracing the unknown and the lingering desire to just go and do. and i think, “man, i wish i were as unafraid and bold and in tune with my inner child”, but sadly, i am not. does it all HAVE to mean something? likely, the answer to this question is absolutely not. because if we allow ourselves to drift back to our childhood, maybe we can see that these gifts and creative impulses are to bring delight to God. in those moments of letting loose, we find that those are some of the most treasured moments, moments that mean a great deal to our Father. He made us…and that doesn’t just include our thoughts and our actions and how we turned out as a responsible, involved adult…it means our creativity, our imagination, our dreams, our sense of humor. He made all of it. let loose, be ridiculous, draw a picture for no one, sing a song alone, make up a dance routine to a song in your kitchen (c’mon, you KNOW you used to do that when you were a kid…always a choreographer), tell a story that is complete fiction and fantasy and includes mermaids and giant sea people…do it, and you will feel all that stress and all that adult-ness wash away, if just for a moment. it doesn’t mean it won’t still be there, but maybe it will make it a little more manageable with a tiny laugh tucked safely away in your arsenal, helping you get through it with a smile.